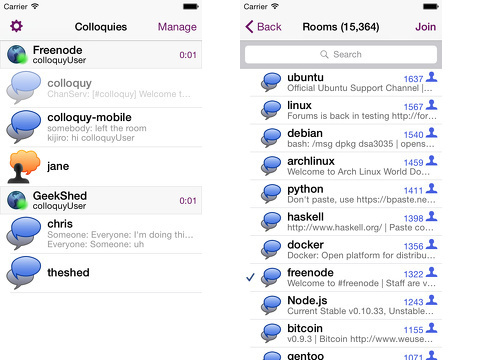 Colloquy for iPhone and iPod touch gives you the 20 year old IRC protocol in your Apple mobile device. It is another in a line of local server based extension apps that software manufacturers have been coming out with lately. Connects to your Mac so you can access to everything Colloquy is connected to. Even if your WiFi or EDGE network drops, you will get all the messages once the network comes back. 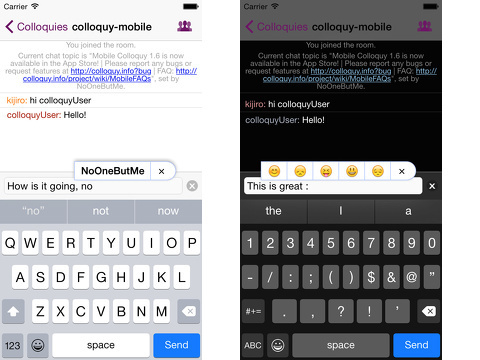 Use all your favorite Colloquy scripts from your phone using the same IRC commands. Specially designed interface to match the iPhone and iPod touch with landscape support. The Colloquy open source app is great because you can view its complete source code especially if you are concerned with privacy issues. Colloquy is also free OS X IRC software client although it is not currently supported for the latest El Capitan. AppSafari review of Colloquy was written by Joe Seifi on October 8th, 2007 and categorized under App Store, Chat, Social, Utilities. Page viewed 6200 times, 1 so far today. Need help on using these apps? Please read the Help Page.